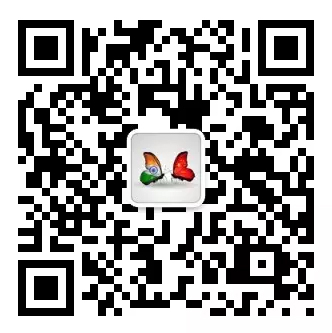 China India Dialogue China India Dialogue | Elephant S.O.S. Asian elephants face the same persistent threats they have faced for years worldwide: human development and the ivory trade. 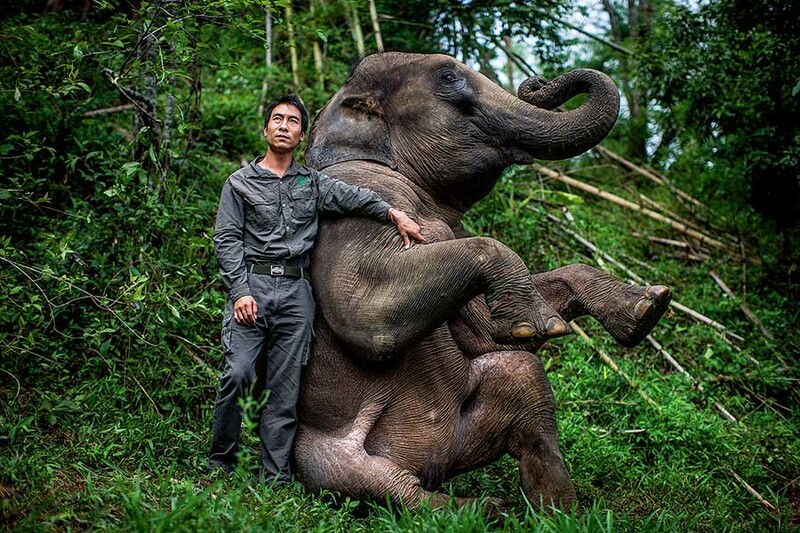 Xiong Chaoyong, deputy head of the Asian Elephant Breeding and Rescue Center, with an elephant friend. Having been involved in Asian elephant protection for more than 16 years, Xiong believes that Asian elephants are very intelligent mammals. In the Xishuangbanna Dai Autonomous Prefecture is the Xishuangbanna National Nature Reserve in southern Yunnan Province. Despite its relatively limited area of less than 250,000 hectares, the reserve is home to one quarter of China’s wild animal species and a fifth of its wild plant species. The nature reserve is warm, humid and rainy all year round, gifting the area tremendous biodiversity and China’s best-preserved tropical rainforest at a comparatively high latitude and altitude. An abundance of rare animals inhabits the tropical rainforest, of which the wild Asian elephant is the most famous species. The flagship animal even won Xishuangbanna the reputation of being the “elephant prefecture” in ancient China. Today, the world’s two major species of elephants are distinguished by their native continents: Asia and Africa. With an estimated wild population of between 30,000 and 50,000, the Asian elephant is distributed across 13 Asian countries, including China. Statistics show that about 300 wild Asian elephants lived in China in 2015, of which 250 were located in Xishuangbanna. Wild Elephant Valley, one specific scenic spot in Xishuangbanna National Nature Reserve, is home to about 70. A group of wild Asian elephants relaxing and playing at the river bank. Generally speaking, wild Asian elephants seldom attack humans unless their territory is invaded or they feel that their calves are threatened. On an ordinary day in July 2016, it was stiflingly hot despite the towering trees shielding people from the sun’s direct rays. The light still filtered through the dense branches and leaves. Yan then pointed towards a group of wild Asian elephants relaxing and drinking from a river just 20 meters away. He quickly scribbled a note reading, “At 11:30 a.m., 26 wild Asian elephants were spotted: one adult male, five adolescent males, four calves, ten adult females and six adolescent females.” He was so thrilled to see such a large group that his writing was especially illegible. 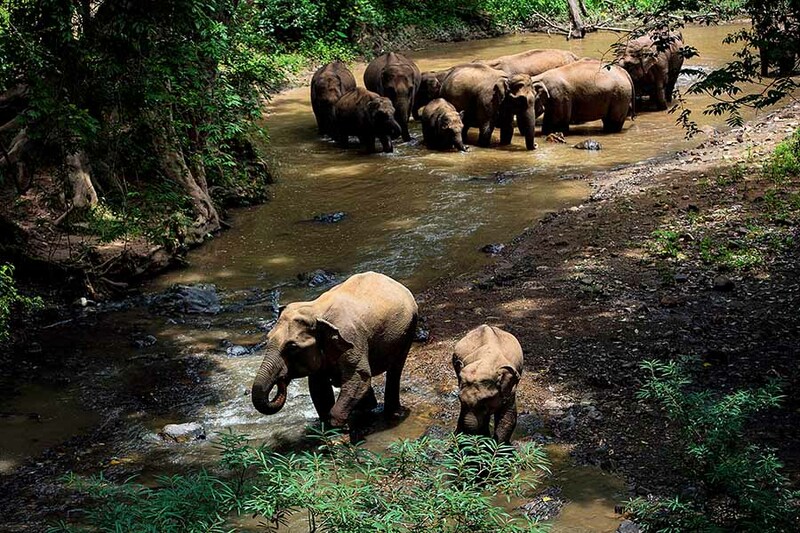 Wild Elephant Valley, located in the Mengyangzi section of the Xishuangbanna National Nature Reserve, first launched efforts to protect the wild Asian elephant in the late 1980s. Then, governmental agencies began placing salt at river banks the elephants frequented. Wild elephants need salt and other minerals that are often hard to come by in their natural environment. 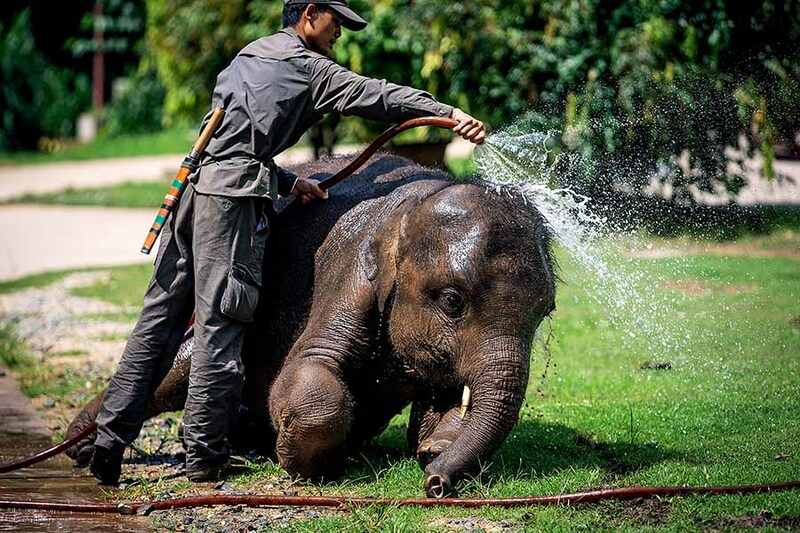 An employee at the Asian Elephant Breeding and Rescue Center showers off a calf who has just returned from searching for food in the wild. The lovely creature, named Ming Ming, is usually the quiet type. However, if it gets excited, it can turn very naughty. Alongside the Asian Elephant Observation and Protection Center, the Asian Elephant Breeding and Rescue Center is also based in the valley. Bao Mingwei, a veterinarian at the breeding and rescue center, is known for his skill at delivering anesthetics by blowing them through a pipe. Using his long blowpipe, he can sedate a wild Asian elephant from ten meters away so specialists can treat and help it. In 2007, Bao and his coworkers found a sick adult female Asian elephant in the wild, which they named Ping Ping. She had contracted a severe infection around her hip and was nearing death. Wary of attack by members of her herd, Bao and his colleagues sedated Ping Ping with the pipeblown anesthetic and immediately treated her on-site. Within two weeks, Bao and other experts had formulated a treatment plan and successfully performed surgery. A calf in water. 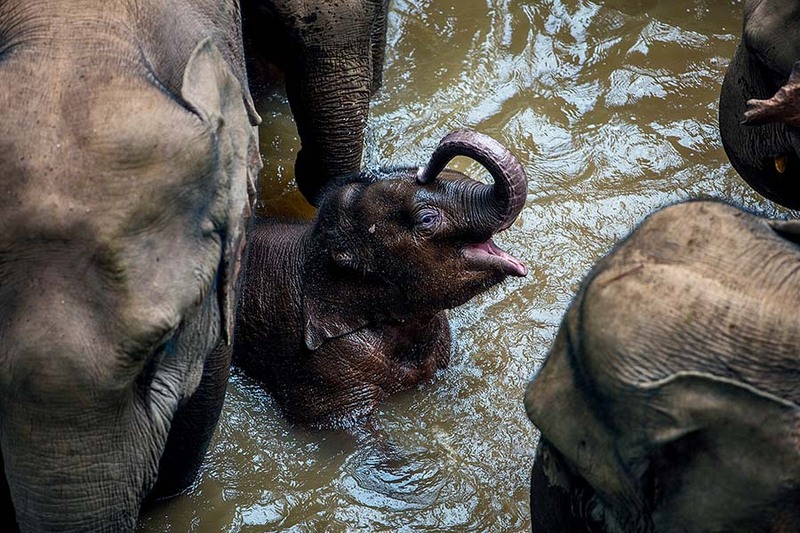 Asian elephants have a similar life expectancy to humans and stop growing around the age of 30. Human development steadily encroaches on elephant habitat, pushing them out. Compounding the problem, the gradual shrinking of tropical rainforests has further exacerbated habitat loss, forcing elephants to venture out of forests in search of food, into areas inhabited by humans. Despite international efforts to end it, the ivory trade remains rampant globally, and as well as causing a serious gender imbalance, it has even influenced the animal’s genetics. In a reversal of Darwin’s “survival of the fittest,” adult male elephants with the most beautiful tusks have the hardest time surviving. Since adult males with small or even absent tusks survive more easily, the dominant tusk gene is gradually disappearing. At present, this external pressure has resulted in an absence of the iconic incisors in at least half of the global male Asian elephant population. And the male-female ratio of Asian elephants worldwide sits at a staggering 1:12. Asian elephants have approximately the same life expectancy as humans and stop growing at about age 30. Also like humans, females usually give birth to only a single offspring per pregnancy and reach sexual maturity in their teen years. This long life cycle makes threats to the species’ population even more challenging to face. For years, the Xishuangbanna National Nature Reserve has been making tremendous efforts to preserve wild Asian elephants. To reduce human-elephant conflict, the nature reserve has reduced traditional rubber plantations through developing commercial agarwood forests, and launched projects such as biological isolation belts and elephant food bases. Moreover, a comprehensive observation network for wild Asian elephants has been established. More than 40 observation spots have been set up across the nature reserve, where professionals identify and track individual elephants and collect data. Complementing strict international bans on the ivory trade, the nature reserve has carried out extensive international cooperation in recent years. Large areas for elephant protection have been designated along border areas. By 2015, China and Laos had jointly designated five zones for joint elephant protection with a total area of 200,000 hectares. Photos courtesy of Jia Daitengfei.